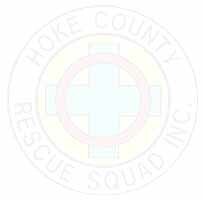 The Hoke Rescue Squad was organized. February 16,1962 as a civic project of the Raeford Moose Lodge at the suggestion and support of Mr. Sam Motley who was Lodge Governor. Initial enrollment was 16 men, all members of the Raeford Moose Lodge. Bobby L. Stanfill was appointed acting Commander. Training was started immediately and an ambulance was donated for use by the Squad from Lentz Funeral Home of Raeford (the unit shown on the previous page) . First Aid instruction and rescue techniques was taught by Mr. E. R. (Red) Brooks of the Raeford Civil Defense Team. The Squad was to operate as an auxiliary Civil Defense Unit for Raeford and Hoke County as well as a rescue unit. Sufficient funds were raised by the Moose Lodge and within the Squad itself to equip the ambulance and purchase initial items of equipment. On July 4,1962, it was determined that the Squad had sufficient training and equipment to become operational and was declared so to the civil authorities of Raeford and Hoke County. 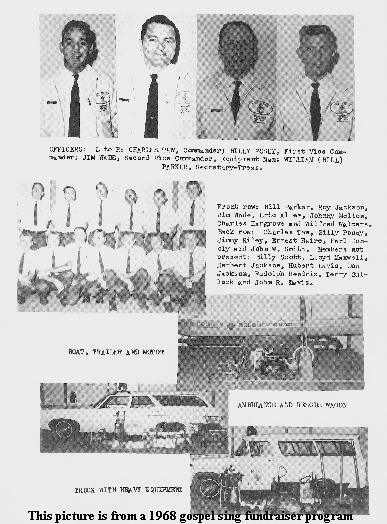 The Squad operated as a project of the Moose Lodge until June 1965 at which time it was released and incorporated as an independent non-profit organization. The ambulance was sold and a panel truck was purchased to haul the increasing pieces of rescue equipment donated to or purchased by the Squad. Several fund raising projects were conducted by the Squad and money raised was used to trade vehicles and newer and more dependable ones were acquired. Commissioners of Raeford and of Hoke County were approached in 1965 about the possibility of financial support for the Squad. Results were favorable and has been a great help to the squad in offsetting operating expenses and in obtaining newer and better equipment. In 1968, Mrs. Lewis Upchurch, Sr. donated the facilities of the old Raeford Airport hangar building to the Squad at no cost. The Squad spent several hundred dollars for repair and incurred many manhours preparing the building for Squad use. (The above was written for the souvenier program for a fundraiser the Rescue Squad sponsored in the late 1960's bringing the Authur Smith show to the Gibson High School (now Hoke County High School). In 1971, the Rescue Squad built the original Rescue Squad Base at 112 Adams St. The Rescue Squad then built a 3 bay addition in 1982.